Some have sold for $500K and, like soccer, pigeon racing is more popular outside of the U.S. It's also pretty high-tech. A racer from Wilton takes ABC10's John Bartell under his wing, and explains how it all works. WILTON, Calif. -- You've heard of horse racing and greyhound racing, but what about Pigeon racing? It’s an age-old sport, popular in just about every country other than the United States. Dave Enders is a part of the Sacramento's Fort Sutter Pigeon Racing Club. He raises 60 to 70 pigeons at his loft in Wilton. He is kind of the "Pigeon Godfather" when he is in his coop. "I have watched these pigeons through [the] whole process," said Enders, "from hatching to releasing them for their first race." 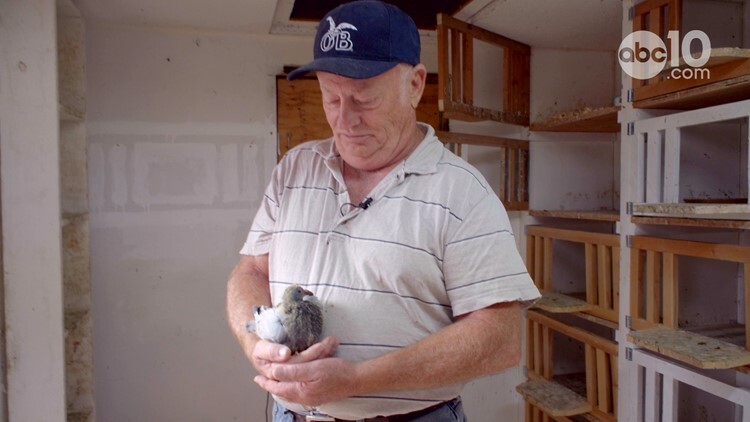 Dave Endress, a pigeon racier from Wilton, holds a 16-day-old chick. Endress says that, while there are records of some pigeons living 19 years or more, most racers average about 10 years. Raising pigeons or doves dates back thousands of years. You may know them as homing pigeons or carrier pigeons. They were used to deliver messages over long distances. Enders doesn't send messages, though. He is racing his pigeons. "In Europe, it's only second to soccer," said Enders. Pigeon racing is a worldwide sport with millions of dollars at stake. In Taiwan, the event is even televised, but in the U.S., it’s not so popular. "It’s kind of a dwindling sport because youngsters these days are on their phone," Enders joked. Pigeon racing may be an old sport, but today it takes a lot of new age technology to win a race. "When the bird comes back and lands on the landing board, it's logged into a computer," explained Enders. Owner Dave Endress shows the leg band that identifies each of his racing pigeons. It also contains a chip that notifies Endress and race officials when his pigeons have crossed the antenna in the coop that functions as the finish line. Pigeon racing is a little complex. The starting point is the same, but racing pigeons only know how to fly home to the coop they were born in. That means the finish line for every pigeon breeder is different. "No two lofts are the same distance, so you have to have a mathematical playing field to make it a level playing field," said Enders. 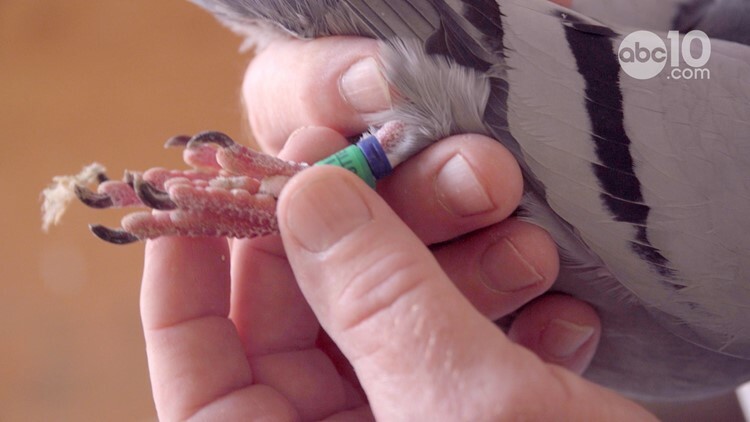 Each individual pigeon has a microchip that records speed or yards per minute. The bird with the fastest speed wins. It not clear how the racing pigeons know how to get home, but that is part of the intrigue behind the race. "These birds are going anywhere from 150 to 600 airline miles," Enders said. "It's very satisfying when they come back, especially after a hard race or a race with bad weather. Just the fact that they can do it fascinates me." Enders' birds are not your average pigeon. The "Pigeon Godfather" raises them from egg to athlete, and to him, they're family.